Reminder – Electronic submittal of all injuries and illnesses data for calendar year 2018 must be submitted on the OSHA ITA website by March 2, 2019. Covered establishments, which includes Agriculture, are required to electronically submit information from the Form 300A (Summary of Work-Related Injuries and Illnesses). For instructions on electronic submittal, please go to the federal OSHA’s ITA Website www.osha.gov/injuryreporting/index.html . 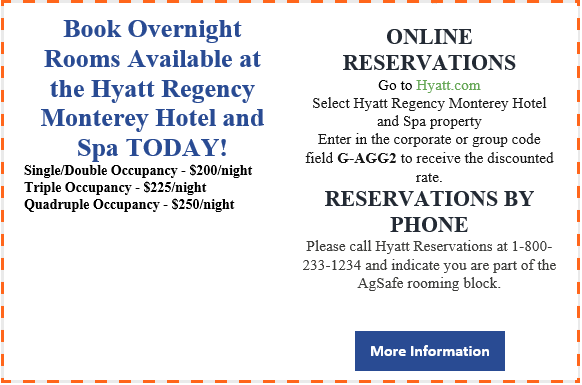 This entry was posted in NEWS & ISSUES on February 25, 2019 by ccgga. Join us for the 48th Annual Turf Day Golf Classic Monday, May 13th at the Belmont Country Club, proudly sponsored by My Job Depends on Ag! Proceeds from the tournament will benefit deserving students and programs in the Jordan College of Agricultural Sciences and Technology at Fresno State. Ag One’s efforts will provide approximately $700,000 to students and programs for the current academic year. Come out, have fun and help support students at Fresno State! This entry was posted in NEWS & ISSUES on February 21, 2019 by ccgga. 2019 Aerial Devices and Fall Protection Workshops! Western Agricultural Processors Association (WAPA) has partnered with The Zenith Insurance to offer several Aerial Device and Fall Protection Workshops. All workshops will be in English and held from 7:45 am registration, class 8 am – 12 pm. The workshops will provide an overview of the regulatory requirements and participants will be given safety training materials to assist with onsite training. This training is geared toward owners, supervisors or any person who is responsible to conduct onsite training. Cost: $50 per person. Register online https://www.wapa-events.com/aerial-lift-fall-protection or contact WAPA (559) 455-9272. This entry was posted in NEWS & ISSUES on February 20, 2019 by ccgga. Congratulations to the 2019 Common Threads Honorees! In 1997, the California Ag Leadership Foundation (CALF) teamed up with the College of Agricultural Sciences and Technology and the Ag One Foundation, both at California State University, Fresno, to honor women in agriculture who have chosen to make a philanthropic difference in their communities and our world. The Common Threads Award recognizes individuals whose exemplary and extraordinary contribution of time, energy and resources has enhanced those around them. And now, Ag One, the Jordan College of Agricultural Sciences and Technology at Fresno State and the California Agricultural Leadership Foundation are pleased to announce the honorees for the 2019 Common Threads Awards: Kathy Briano, Visalia; Tina Carreiro, Lemoore; Giovanna DePaoli, Strathmore; Marcia Shafer, Parlier; and honorary recipient Margaret Mims, Fresno. Common Threads has annually honored the lives of outstanding Valley women since 1997. These women, whose roots are deep in agriculture, have made a difference in their communities with bountiful giving of their time, talent and treasure. Please join us on March 27, 2019 at the Clovis Veterans Memorial Hall to celebrate our honorees. The no-host wine social will begin at 11 a.m. followed by lunch and awards program from 12 – 1:30 p.m. Tickets are $50 per person thru March 15, 2019 and sponsorship opportunities are available. For more information, visit https://www.agleaders.org/alumni/common-threads-central-valley/. The California Air Resources Board (CARB) is seeking participants for an update to their Agricultural Tractor and Mobile Equipment Survey. For those that remember, CARB conducted a similar survey in 2008, and partnered with Cal Poly in their review of the submitted surveys. This survey effort is looking to inventory various mobile agricultural equipment, including tractors, combines, balers, agricultural use ATV’s and forklifts, and many more. This survey is extended out to producers in the field, custom operators, and first processing facilities, and covers equipment using any type of fuel or electricity and any horsepower. Responses to the survey are completely confidential and are anonymized upon receipt. The survey that was previously conducted in 2008, was utilized to help fund incentive programs for agricultural equipment turnover programs utilized throughout the state. CARB’s goal upon completion of this upcoming survey round is to utilize the data in the exact same manor, to utilize results to determine the best usage of incentive monies in the agricultural sector. The survey is being made available through the internet. Please follow the link attached below to complete the survey. If you have any questions, please feel free to contact offroadinventory@arb.ca.gov. Paper copies will be available if you would like, feel free to contact Chris McGlothlin with the California Cotton Ginners and Growers Association at chris@ccgga.org or by phone at (559) 252-0684. We’ll handle all the details over the phone. This entry was posted in NEWS & ISSUES on February 14, 2019 by ccgga. This is the final day for producers to sign-up for the Market Facilitation Program and we want to be sure all our California famers have the opportunity to apply. The information below are the final instructions for producers. Producers can apply without proof of yield, but must certify 2018 production by May 1, 2019. USDA previously announced the second and final round of trade mitigation payments. Producers need only sign-up once to be eligible for the first and second payments. For more information, or to make an appointment to apply, please call your local FSA Office. If you have any additional questions, please contact Brooke Raffaele at the USDA California Farm Service Agency at 530-219-7747. Effective January 1, 2019 California law requires employers with 5 or more employees to provide not only two hours of sexual harassment and abusive conduct prevention training with Supervisors, but also a 1-hour training to all non-supervisory employees. The Western Agricultural Processors Association and California Cotton Ginners and Growers Association in partnership with AgSafe, will be offering 1-hour Nonsupervisory Webinars. This entry was posted in NEWS & ISSUES on February 11, 2019 by ccgga. 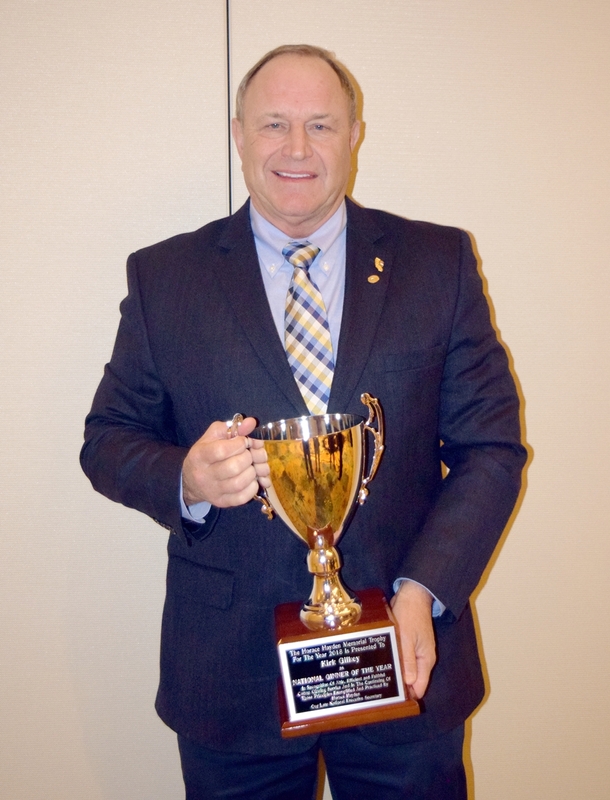 California’s own Kirk Gilkey, Manager of the Cross Creek II Gin, was this year recipient of the National Cotton Ginners Association’s (NCGA) Horace Hayden Ginner of the Year Award! This is well deserved and a long time coming for one of the industry’s tireless contributors. He was born and raised in Corcoran, California and has deep roots in the cotton industry. He attended High School there in Corcoran where he was a star football player. In fact, he was so good that he received a scholarship to play football at Arizona State University. He left Arizona State and attended California Polytechnic State University where he received his Bachelor of Science degree in Ag Business Management. Interesting to note that in 1980, he was selected to tour the British Islands with a California Rugby squad which competed against British Rugby teams. He is one of the most active Ginners in California Cotton Ginners and Growers Association. He has served for many years as a board member of the Association. He served as Chairman of the Association in 1996 and was named that association’s recipient of California Ginner of the Year in 2000. Furthermore, he has been a longtime Ginner delegate to the National Cotton Council, current Board Member of the NCC Board of Directors and Past President and Chairman of the National Cotton Ginners Association in 2010 and 2011. In addition, he has served either as chairman or as a member of most of National Ginners’ Committees and Subcommittees. He also served many years on the NCC’s Joint Industry Bale Packaging Committee and as Chairman of the Council’s Packaging and Flow Program Committee. Currently, he is Manager of the Cross-Creek II Gin, General Manager of Gilkey Farming Enterprises and General Manager of, and a partner in, Gilkey Five. In addition, Kirk is a trustee for the Corcoran Methodist Church and the Corcoran Community Foundation. Kirk also served as Past President for the Corcoran Chamber of Commerce and served on the Board of Directors of Corcoran’s YMCA for over 10 years. 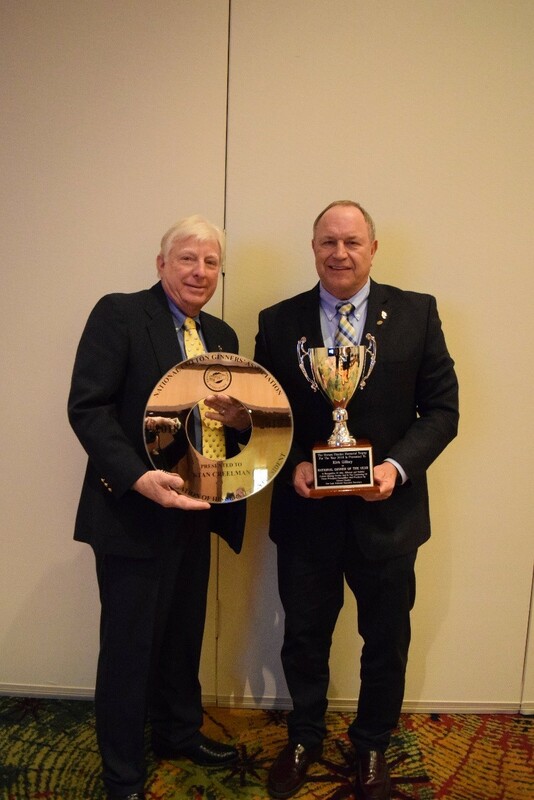 The Horace Hayden Ginner of the Year award is presented annually to a ginner in recognition of able, efficient and faithful cotton ginning service and in the continuing of those principles exemplified and practiced by Horace Hayden, former Executive Secretary of NCGA. Previous winners from California include Louie Colombini, Buttonwillow Ginning & Westside Farmers Coop; Stan Creelman, Mid Valley Cotton Growers; Michael Hopper, Farmers Coop Gin; Loyd Colbert, Modern Ginning; Bob Faris, Elbow Enterprises; Ken Rowan, Broadview Coop; Tom Miller; and Macon Steele, Producers Cotton Oil. Congratulations to Kirk Gilkey! The Association would like to recognize all of his contributions to the California cotton industry and say: Job well done! At this past National Cotton Council Annual Meeting, Stan Creelman, Manager of the Mid Valley Cotton Growers gins, wrapped up his tenure as President of the National Cotton Ginners Association (NCGA). Stan, who is a current board member of the California Cotton Ginners and Growers Association, and past Chairman (2001-2002), continued a long tradition of leaders from the California cotton industry. Past NCGA Presidents included Kirk Gilkey, Cross Creek Gin; Michael Hooper, Farmers Coop Gin; Bob Cozzi, Anderson Clayton Corp; Ken Rowan, Broadview Coop; Macon Steele, Producers Cotton Oil; and Harry Thompson. The California Cotton Ginners and Growers Association would like to recognize Stan for his service to the industry and his willingness to go above and beyond to serve the cotton industry. Thank you for all that you do Stan!